A few weeks ago, I cleaned out the embroidery & needlework section of my Feedly feed. Feedly is a feed reader that organizes blogs and news websites that you want to follow regularly, and it keeps track of what you read, what you like, and what you want to return to, to read again. I hadn’t cleaned my feed out for a long, long time. 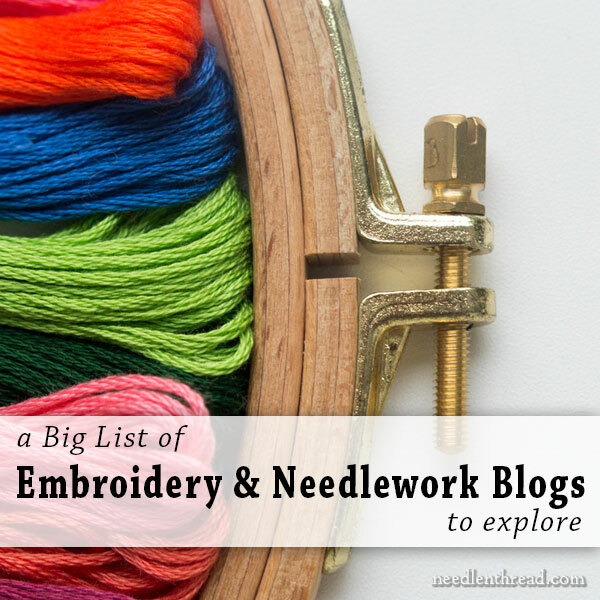 Over 200 needlework-related blogs were lurking in there. As often happens with blogs, many of them had Died the Death of the Blogosphere. They disappeared. They became defunct. They froze in time, date stamped three years ago. Or they shifted focus completely. The clean-up job left me with less than a quarter of the original list. Some of them are newer, some of them are tried-and-true and have withstood the test of time. All of them offer something for the embroiderer, from instructional content, to inspiration, to history snippets. For your weekend reading, I’d like to share with you my Big List of Embroidery & Needlework Blogs worth exploring. So, grab a cup of tea and pull up a chair and join me, while we explore! So, here it goes – my list (and it’s a long one)! You’ll probably find several blogs on here that you already know. Hopefully, you’ll find some new gems that you can add to your own list of blogs to follow. & Stitches – A collaborative blog (meaning more than one person produces the content) – the focus: contemporary embroidery craft. Allie’s In Stitches – Allison Aller’s blog, primarily about crazy quilting. Anna Scott Embroidery – Anna focuses on traditional surface embroidery techniques, like crewel work, stumpwork, goldwork. Agulhas Da Meri – Meri lives in Portugal. She writes (in Portuguese and sometimes in English – use Google translate) about Portuguese embroidery, drawn thread work, and the like, with a mix of quilting and sewing and other needlework related crafts. Beautiful Metaphor – This is Liz Adams blog, covering all kinds of multi-media textile work, including embroidery, goldwork, beading. Big B – Kimberly Ouiment writes about contemporary embroidery craft, featuring her pattern collections, and she has quite a few embroidery stitch tutorials on her site, too. A Kimberly Design – especially for the needlepoint enthusiast, lots of contemporary needlepoint and lots of color. Colour Complements – Lorraine Stobie’s blog featuring her dyed embroidery threads and projects worked with them. Lots of color. Di va Niekerk – Di focuses on ribbon embroidery and includes tips and photos of exquisite ribbon embroidery on her blog. Eleanor Pigman – She’s a bead artist. She features photos of her finished pieces, which she sells. Lots of marine-related bead embroidery. Eisabetta Ricami A Mano – Italian blog (you can use Google translate to read it) featuring beautiful classic embroidery and monograms. Feeling Stitchy – another collaborative blog focusing on contemporary embroidery craft. Fils et aiguilles – Yolande’s needlework blog is written in French, English, and Dutch, and it covers all kinds of embroidery, from Schwalm whitework to Hardanger and more. Gentle work – Featuring simple, clean, and gentle textile art. Love Stitch – In the Studio – Classic embroidery by an RSN graduate. In-Stitches – Textile history mixed with contemporary crafting. Italian Needlework – Jeanine (in Canada) writes about Italian needlework, with occasional tutorials, book reviews, and history. Janet Granger’s blog – She writes about miniature embroidery, classic embroidery, and project development. Jessica Grimm – Jessica writes from the Netherlands. Her blog (written in three languages, one of which is English), focuses on classic embroidery techniques, goldwork, crewel embroidery, and so forth. Karen Ruane – Traditional embroidery with a modern, fun twist. Karen focuses on a lot of whitework and texture, but color creeps in here and there, too. Katherine Diuguid – traditional embroidery, goldwork, and the like, with a bit of personal mixed in, and travel. Kelly Cline Quilting – Primarily about long-arm quilting, she does some amazing things with vintage embroidery pieces. Diamond K FolkArt – Historical embroidery, woodworking and needlework tools. Luzine Happel – The focus here is entirely Schwalm Whitework, with lots of tips, techniques, and tutorials. The blog is available in both German and a very good English translation. Magpie’s Mumblings – The focus is crazy quilting, multi-media textiles and crafts, and general adventures in needlework. Materialistic – Kelly Fletcher’s blog focuses on clean, simple, contemporary embroidery that’s very stylish. She has a new book coming out soon. Ornaments – Orna Willis’s needlepoint blog focuses on needlepoint, color, project progress, classes, threads and so forth. Pintangle – Sharon Boggan writes from Australia, and her blog focuses on stitch challenges, stitch tutorials, and crazy quilting. Plays with Needles – Susan Elliott’s blog focuses on embroidery, crazy quilting, lots of eye candy, Japanese embroidery, photography, crafts, and her family. Rosalie Wakefield – Millefiori – Rosalie focuses on Brazilian dimensional embroidery. Rose Andreeva – Roniy-Stitch – Written in Russian (use Google translate), lots of traditional embroidery techniques, beautifully executed and often with a fun or interesting twist. Sarah’s Hand Embroidery Tutorials – A whole lot of embroidery stitch tutorials. Salley Mavor – Salley’s blog focuses primarily on her Wee Felt Folk, plus a little bit of travel and lots of beautiful photography. Sebastian Marchante Gambero – Spanish Goldwork and ecclesiastical embroidery is the focus. The blog is not frequently updated, but there’s a lot of beautiful goldwork to explore. It’s in Spanish – you can translate with Google. Sew in Love – Elizabeth Braun’s blog focuses on embroidery techniques (with some tutorials), general embroidery discussion, travel, and personal topics. String or Nothing – The focus here is blackwork, samplers, cross stitch, historical designs, some knitting and embroidery patterns. So September – The focus here is on contemporary embroidery craft and other crafts. The Crafter’s Apprentice – Wendy’s quest is to conquer all crafts – embroidery, needlework, etc. – and she writes about them as she tackles them. The Embroiderer’s Story – This is Tricia Nguyen’s blog for Thistle Threads, and it focuses on historical embroidery, the development of historical threads and the like, and her classes. The Rebellious Needlewoman – It’s Hazel Blomkamp’s blog – need I say more? She focuses on classic embroidery with a contemporary twist, Jacobean designs, and so forth. Trish Burr’s blog – Trish’s blog focuses on her exquisite needlepainting and her new ventures in modified whitework (whitework with a contemporary twist). The blog is mostly promotional but also features good tips and beautiful embroidery. The Unbroken Thread – Kathy Andrews writes from Germany (in English), focusing on various techniques, needlework-related travel, some tips, and project updates. Threads Across the Web – Carol-Anne’s blog focuses on all kinds of surface embroidery, with emphasis on Japanese embroidery. Lots of project progress to follow, along with tips and inspiration. Tortoise Loft – Sue Jones writes from England about her pursuits in embroidery and other needlework. Two Nerdy History Girls – The focus is mostly costuming, but some historical needlework, with often funny and peculiar snippets from history in general. Two-Handed Stitcher – Laura Perin’s blog on needlepoint features her designs, project development, color, threads, and class information. White Threads – Yvette Stanton writes from Australia (in English – ha ha – just a joke, to see if you’re still reading…), mostly about whitework embroidery, sometimes about other needlework and sewing, and some personal. Wild Olive – Mollie Johanson writes about cute, contemporary stitching. Her new book Stitch Love is a good one for crafting with kids who are interested in textiles. William Morris in Quilting – Michelle Hill is an avid Morris fan who quilts and designs. She writes from Australia about quilting, travel, and Morris-related stuff. Y*Handmade – Yuki Sugashima writes from Japan about handcraft, embroidery, and life in Japan. She has a new book coming out. Her blog is in English and Japanese. The End – Any Additions? That, my friends, is my current list, although I do have another section of Feedly titled “Other Needlework Crafts” that I haven’t tackled yet. Do you have any favorite embroidery or embroidery-related blogs that you enjoy and you’d like to recommend? Did I miss any obvious ones? Do you write a blog related to embroidery that you’d like to share? You’re welcome to mention it in the comments below! Have you come across Urban Urban Threads? Lots of patterns for machine and hand embroidery and some really quirky and gothic and baroque type designs. Thanks for the tips in the blog above. I shall have a happy time exploring. Thanks for the great list, Mary. Embroidery blogs can be really hard to find sometimes. One of my favorite embroidery designers doesn’t have a blog, but updates her website frequently and is worth keeping an eye on…Alison Cole. She’s in Australia, but offers online classes and travels to the US to teach quite often. Tanja Berlin in Canada does both embroidery (needlepainting in particular) and counted work. As with Alison she doesn’t have a blog. Both Alison and Tanja have regular email newsletters that, in my mind, are good alternatives to a blog. I’ll be going through your list and adding some blogs to my Feedly account this weekend, I think. Hi, Carol – I too keep up with the designers mentioned above. They don’t have blogs, but I get their newsletters and I frequently pursue their websites to see what’s new. Hi Mary, One of the very first sites I ever visited was the one from Di van Niekerk. Besides her online shop, she also writes a regular blog. Here is a link to it. http://www.dicraft.co.za/blog/blog/ She also sends out a regular newsletter. I am going to investigate the ones you recommended over the weekend. Oh, Sheesh – I have Di on my list – I don’t know how I missed it when typing up the post….! I’ll add it! The blog universe seems to be never ending, doesn’t it? lol 🙂 I’ll have to explore this list. Thanks, Ms. Corbet! Thanks for this comprehensive list. There is a little for everyone. It’s always encouraging to see the beautiful things that can be made with a needle and thread. Of course you are my favorite blogger and my go to guru for all things embroidery. My blog at beautiful metaphor.blogspot. com follows the progress of my mixed media art, often including embroidery, particularly goldwork. Local stitchers who know my work and have been in workshops I’ve taught like to follow it, as well as readers all over the place! Thank you for a wonderful list. I bookmarked a few. I also follow a blog by Yolande. She writes in English, French and another language (Dutch?). Lots of wonderful pictures of her work. Oh, my! This is going to take a long time to peruse and check out myself. Thanks so much for supplying that list Mary! Now I have a question for you (and anyone else). A couple of weeks ago a couple of sisters and I visited a textile museum in Berkely. (Marvelous! I recommend Lacis Museum) I and another customer asked to see the linen samples behind the desk, and when the clerk brought them out she asked what kind of work we did. The other customer said “Cross Stitch” and I said “Embroidery”. The customer then asked me, “Oh! What kind of embroidery?” My brain did one of those flat line things like you see on a heart monitor. What kind? What KIND? I don’t know! Feeling a bit stupid I said, “Oh, all kinds” and she gave me a funny look. (“You don’t know what kind you do?? ?”) Anyway, it got me thinking: What kind of embroidery DO I do? And I wanted to know how you would answer that question. I have done lots of kits, I have done my own designs on cotton, I have done a tablecloth, enhanced quilt squares, towels, t-shirts, curtain tie-backs, and am planning some embroidery/bead combos on linen. I have also done crewel and counted cross-stitch, but I really prefer embroidery. So — what kind of embroidery do I do? 🙂 Surface embroidery. You could call it free-style embroidery, too. But surface embroidery pretty covers it! Elsa Williams Crewel Classics and Jacobean Embroidery (on Facebook). Blackwork Journey explores and develops blackwork embroidery and associated counted thread techniques especially pulled thread work. Anna Hergert is primarily a hand stitcher who teaches internationally. She does everything from small samplers to big quilts but its her stitching that makes them all wonderful. Hope you all enjoy her work as much as I do. Thank you for providing this wonderful resource to embroidery enthusiasts. I am excited to start exploring. I am a quilter who also enjoys embroidery, and on my blog (qisforquilter.com), I love to share embroidery designs from my collection of vintage transfers, designs from vintage coloring books that can be adapted for embroidery, and patterns I have digitally cleaned from early 1900s newspapers. Thank you Carla for mentioning me and my work! I like to show you my white work on my blog. I really enjoy Ivory Blush Roses Blog by Lisa Boni. I’m surprised and delighted to be on the list. Thank you so very much! Thank you so much for the inspirational list! And thanks for mentioning me again. However, I live in Germany since april 2014 :). I know, us Europeans just move like flees. And thank you so much for mentioning feedly. That’s a pretty useful app. Oops, forgot to mention Lena’s blog Parlstikare. It mainly focuses on Scandinavian embroidery and embroidery for medieval re-enacting. It’s written in English. I can’t find this blog. What is the web address? A great list of embroidery and needlework blogs as you say some of them I know but there are new ones to explore, I will have to go through the list and look at them all. Thanks for sharing with us your list of bloggers it’s great to know there are so many that can inspire us to learn and obtain new ideas for our embroidery projects. Thanks Mary look forward to hearing from you next week I hope you have a great weekend. FYI – I used the link to Broderie D’Atan and clicked a link to look at patterns. Now the computer tech tells me it looks like I have a bad Trojan Horse virus. I have good virus protection but apparently not enough for this virus. My computer is down of course, so I’m on my phone, to let you know that you may want to remove that listing for now. Hi, Katrina – thanks for letting me know. I removed the link. Unfortunately, it is still in the newsletters that went out this morning. I’ve never had a problem with that blog myself, but I wouldn’t want anyone else to experience difficulties. Thanks again. Good news–no virus. The tech had told me it was probably a Trojan Horse virus, but he couldn’t get to my house until almost 7 pm last night since he was squeezing me into an already fully-booked day. So sorry for the false alarm. Thank you for this list, Mary! I have added a few more to my feeds. I always enjoy when you send out a list of new sites to visit! Mary, you will have to do a follow up post with more blogs, LOL. Hi, Barbara – thanks for the link – The Cross Stitch Guild isn’t really a blog, but a static e-commerce website. But I’ll definitely explore it! I write a blog, Mary, but this may not quality for your list as I do sell my work. This blog is one where I have fun posting stitched snippets of my designs. So even if my blog cannot join others on your list, you have given me an idea. That is to say, that I should post how to pix for some of the stitches I have used and/invented for my pieces. Sometimes I manage to create a stitch for a certain purpose and then must include instructions for them. You have inspired me! I like to check in on Opus Anglicanum. She does mostly Medieval re-creation and her own Medieval-style work, in period materials and colors. Her subjects and commentary are often humorous! I love Karen Barbe’s blog: http://blog.karenbarbe.com/ It’s almost like looking through a design magazine. She’s got a wonderful eye for color and design. Well, that’s my weekend sorted! thank you for these blogs, a few were new to me. I read a lot of blogs, but I can see how some are too much”mixed media” for you, others are mostly about other crafts that inspire me like knitting and photography. Under a topaz sky is about surface embroidery, designing embroidery, art journalling and occasionally other crafts. Chitra hails from India but lives abroad. She is a very prolific stitcher and combines traditional Indian embroidery with western influences. Annet is Dutch but writes in English. She started out as a quilter, but also does a lot of embroidery and has a few stunning surface embroidery tutorials. Of course, I also write a humble blog. During the last years I haven’t been very good about regular updates, but I got much better this year and do have good intentions for keeping it up. The emphasis is on European folk costume, but embroidery is so much a part of most costumes that Roman includes heaps of photos of many traditional styles of embroidery. I like this one, too, Elaine. I follow it, but I don’t really consider it a needlework blog. WOW. Thank you Mary. How have I missed all that lovely information. A cup of coffee in one hand and one of the blogs off your list in the other – heaven. Thanks so much for doing that for use. You should have a look at Carol Conway’s beautiful blog which mainly (but not exclusively) features Japanese embroidery. Her work is exquisite. Thank you for your lovely recommendation, Caroline. I know that Mary has visited my blog and left comments occasionally but I have been a bit quiet recently, so may be see thought I had abandoned the blog. Not so, it’s just life getting in the way of fun things like stitching and blogging! Oh nononononono….I still keep up with yours, and it’s in my feed reader! I don’t know how I missed you on the list – it just goes to show you my state of mind recently. Rather distracted! I’m updating the list today to add the ones I missed! So sorry, Carol-Anne! No need to apologise, Mary, but it is nice to know that you are still tuned into Threads Across the Web, even if I am not transmitting much lately. Hope all is going well and you will be back to full fitness soon. So, I’ve duly added you and several other regulars that I somehow missed to the list! Ivory Blush Roses blog is wonderful. Thank you Mary for your kind mention of my blog, White Threads. I do appreciate your support! I am somewhat confused about my writing “in English”… Is this an American “in joke”? Yep, it was a joke in American! Just checking to see if people were still reading. Besides, every time I wrote about a blog from another country, I listed the language. I felt sort of obliged…. Plays with Needles and shawkl.com embroidery, both do crazy quilt stitching and Plays with Needles does Japanese embroidery. Any blogs on Hungarian handwork? Ms. Mary, I am grateful you identified Maureen S’s skill as “surface embroidery.” I do much of the same. Would you please offer a simple definition of classic, contemporary, crewel, needlework, and traditional. This will help me better select useful sites for my surface embroidery talents to expand toward. Thank you very much. Thank you so much for the mention Mary! I was up half the night working my way through this great list! Thank you Mary for this wonderful list. I will have hours of fun reading these blogs. Thanks for the reminder, Mary! Thank you Mary! Thanks most of all for the list, i am forever searching for needlework blogs to read and add to feedly. Thank you also for including me in this list. I cannot believe you read my blog! That’s like telling a movie fan that Brad Pitt follows their blog! You just made my day. Good Monday Morning Mary! I’m so glad you missed a few blogs on your list of last week. Otherwise you would not have posted today about revising it. And I would not have known I didn’t get the first email! Such a lovely kind thing to do, sharing your time consuming project! I hope your are mending and feeling stronger every day. Thanks so much for your generosity. Mary thanks so much for including Beautiful Metaphor on your list. Much appreciated. I love to share the process and ups and downs with my readers! And now more people will be able to share. Mary, many times I’ve tried to follow a tidbit to its source only to find something untouched since 2011 or a 404 message. Grr. Thank you for the list of the viable blogs. About the missing, I paraphrase Mr. Praline: ” ‘E’s passed on! This BLOG is no more! He has ceased to be! ‘E’s expired and gone to meet ‘is maker! ‘E’s a stiff! Bereft of life, ‘e rests in peace!………. ‘Is metabolic processes are now ‘istory! ‘E’s off the twig! ‘E’s kicked the bucket, ‘e’s shuffled off ‘is mortal coil, run down the curtain and joined the bleedin’ choir invisible!! THIS IS AN EX-BOG!! Thanks for sharing Mary! You introduced me to some worthwhile sites & reminded me that I haven’t recently visited several others. So much knowledge & inspiration, so little time! I actually learned a few new stitches & found some creative applications for needlepoint. Win-win. The only blog I would add to your list is olderrose.blogspot.com. Allie is great, but Gerry has some excellent tutorials for various embellishment techniques. For adds to the big list, I nominate Ramzi’s PatternmakerCharts website, which contains a giant collection of vintage Sajou and Alexandre booklets, plus Russian folkloric charts, all from the period between 1880 and 1914 or so. It’s been in hiatus, but has recently re-awoken. wow!so many sites to keep me inspired, informed and amazed!! Hopefully one day I will have a blog up to any of these standards! Some of the photography alone is amazing!! Try Cecile Franconie’s blog at http://www.facilececile.com. It’s in French and is delightful – quilting, knitting, embroidery, etc. She does lots of “smalls” and is very colorful. oh, thank you for the mega list, Mary! I spotted a few Italian blogs too, hurray! I’ll make sure to visit some and fatten my Reader list – grazie mille! Hello Mary, I follow your blog and often reference it in my posts. I find it is such a valuable resource for us learning and attempting to improve any of our needlework skills. Always something new to read about, check out or try out! I do not sell and am not sponsored; just have much admiration for those that are designing and sharing and love to promote them. My blog is Canadian Needle Nana; the link is http://canadianneedlenana.blogspot.ca and I love talking about my life in the country too (be warned!). Thank you for the update on needlework blogs. I am a recent subscriber and this list will assist me in current and future stitching projects. Best wishes in November. My goodness Mary – it was with total amazement that I saw my blog included in this list!! To be included among so many amazing needle artists is a huge honour. Thank you. My blog, Nuts about Needlepoint (http://www.nuts-about-needlepoint.com) is the largest repository of needlepoint information on the Internet with almost 3000 entries with free patterns, technical and reference articles about needlepoint for all levels of stitchers, repositories of vintage needlepoint patterns, reviews and interviews. It’s updated daily and has been around since 2001. Thank you for adding your blog to the list! I don’t do needlepoint, per se, but “borrow” needlepoint stitches and techniques from time to time…What a gorgeous, informative site you’ve created! I’ve bookmarked your site and will be visiting often! I see some of my favorite blogs listed above and look forward to checking out the others. Thank you for sharing! Hello! Not sure if this will fit into the band. I can’t find it in the list, though. Thanks for the great list, Mary. Thank you again for the mention. Tried to thank you the first time you posted…hopefully you see this. Wish I had your following! Thank you for being a driving force in this industry! That’s a quite a list. Thanks for the post Mary. Previous Previous post: Fall Stitching, Anyone?